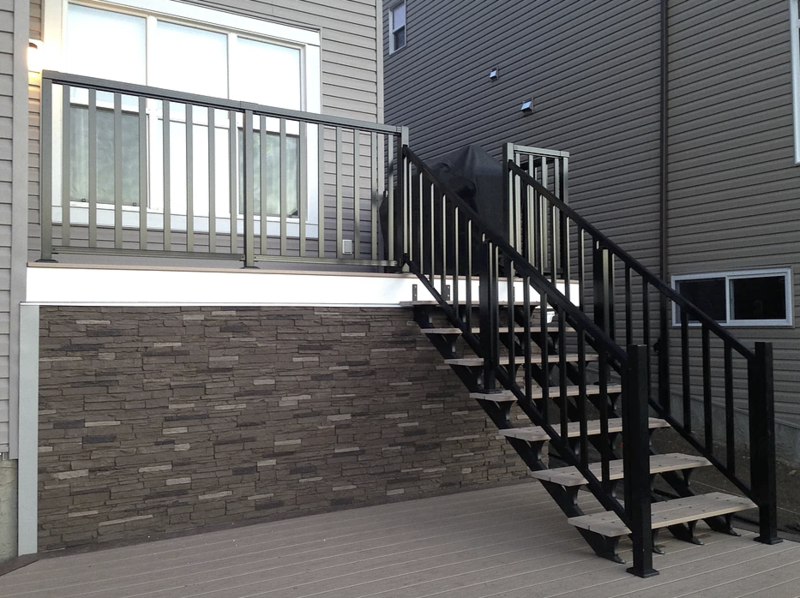 NextStone is a faux stone siding product uniquely formulated from lightweight polyurethane. 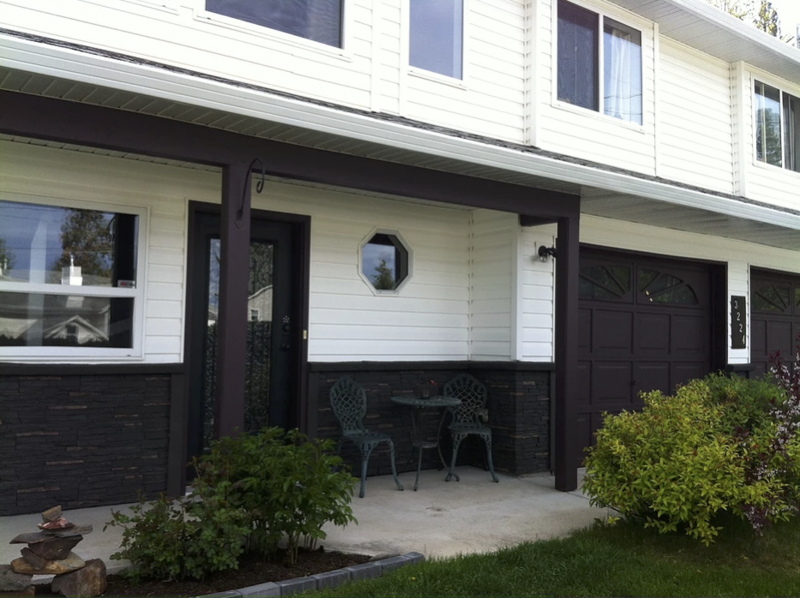 Built-in UV inhibitors and fire retardants, coupled with the proprietary ‘in-mould’ coatings are chemically bonded with the moulded surface of the panel making this a durable and low maintenance solution for your interior and exterior siding. Nextstone panels are lightweight, easy to handle and easily cut, with no special tools required. Without costly labour and installation fees, NextStone provides a realistic stone finish and outstanding durability, at a fraction of the price of natural stone. 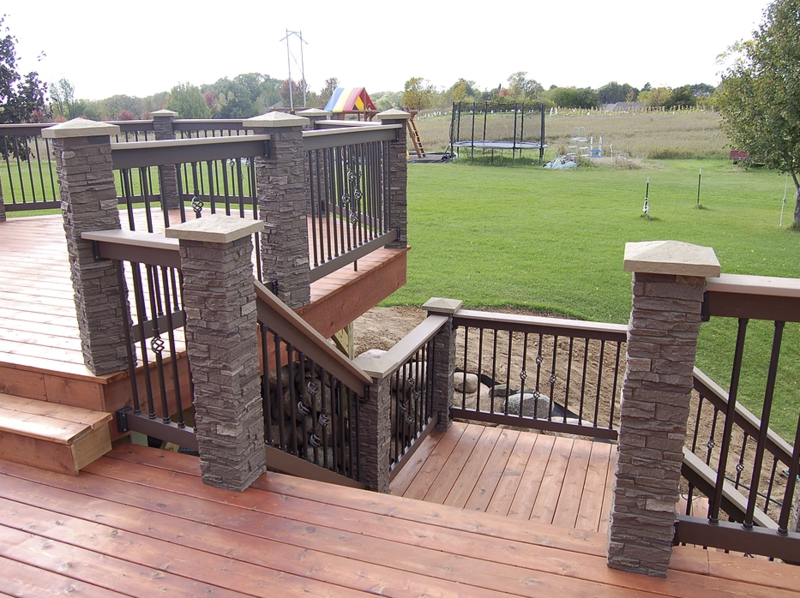 Built to last, NextStone™ is also backed by a 20-year manufacturer’s warranty. 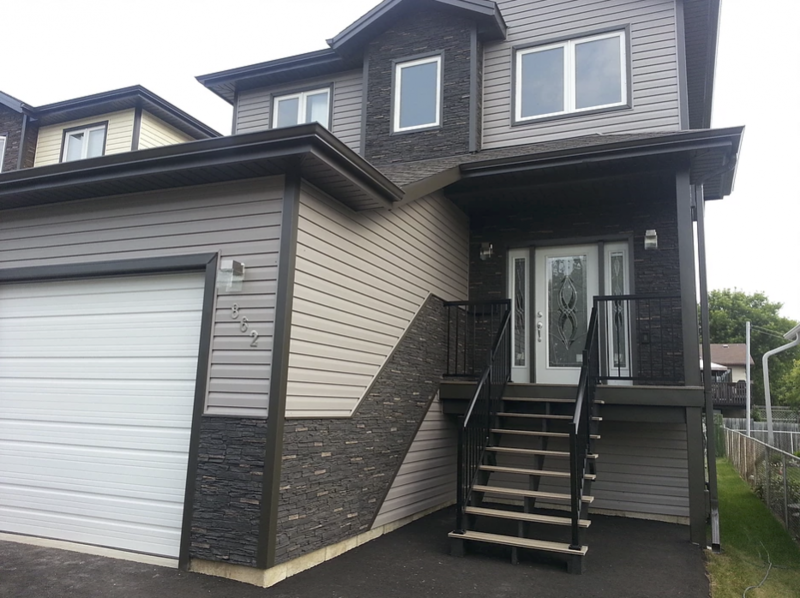 NextStone™ siding panels can be easily installed at home with no formal training within a few minutes. 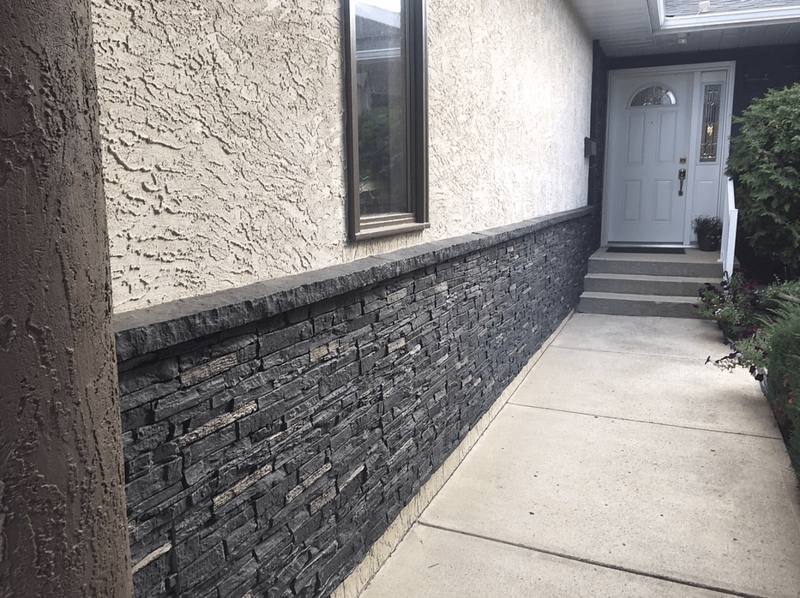 Our innovative panels have been designed to totally rid you of the need to hire masonry installers, professional siding installer, or skilled labourers. Each of our easily managed, lightweight panels only weigh about one pound per square foot, removing the need to pay for additional materials, equipment, or labour. Installing NextStone™ can save construction workers and everyday home-owners a substantial amount of money when it comes to improving residential and commercial buildings. You save time and materials, especially when compared to installing natural stone, brick, or veneers. Weighing only 1 lb per sq.ft, NextStone™ panels are made solid all the way through and are reinforced with recycled PVC. They are also resistant to weathering. 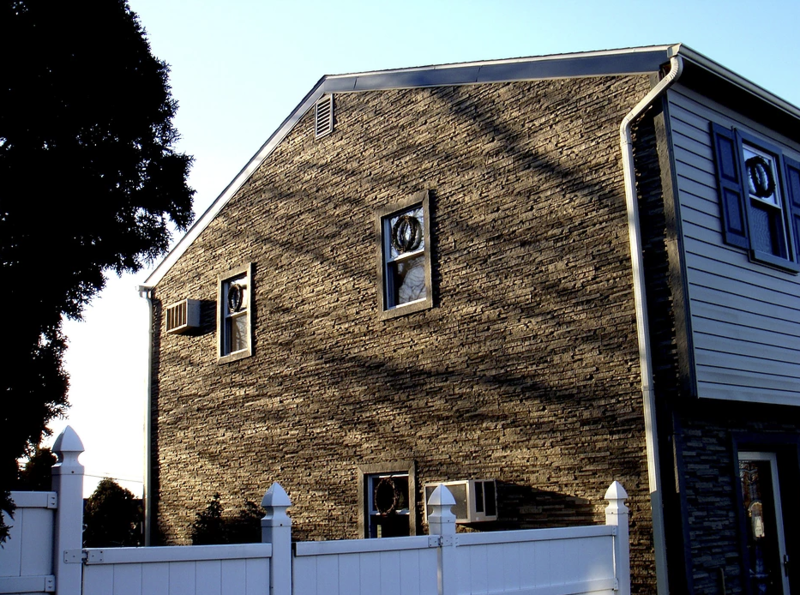 The added toughness of the replicated stone siding means you don’t have to worry about the climate you live in. NextStone™ is made to withstand radical changes in temperature, varying levels of rain and snow, and other extreme environmental conditions. NextStone™ can insulate your home and help you save money on your energy bill. “R-Value” is the ability for a building material to resist heat transfer. 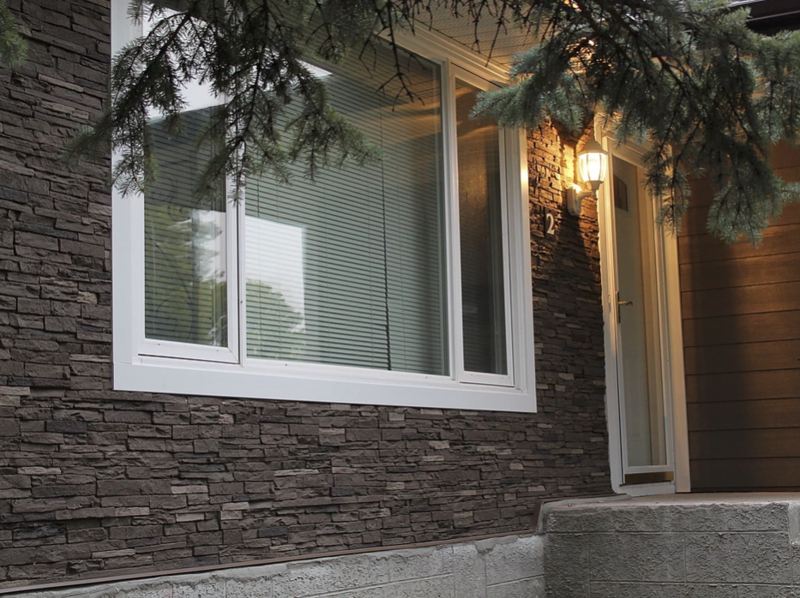 NextStone™ has an R-Value of 4.5 per inch of thickness when used outside your home or office. This additional insulation can help save energy costs by naturally decreasing heating and cooling costs. NextStone™ requires almost no additional work to maintain. The panels do not require any kind of painting, staining, or waterproofing. NextStone™ panels keep their beautiful, natural appearance with only the occasional spray down from the backyard hose. The panels are created with an in-mould coating making them fade resistant and will retain the look you bought it with for years to come. texture, or a new surface can be covered with NextStone™ products. Nextstone ™ products are made with recycled materials and do not tax natural resources. The procedure of harvesting rock, clay and stone materials is harmful to the environment. The damage is increased once you realize quarrying, transporting, and processing these raw materials demands a significant amount of energy and resources. 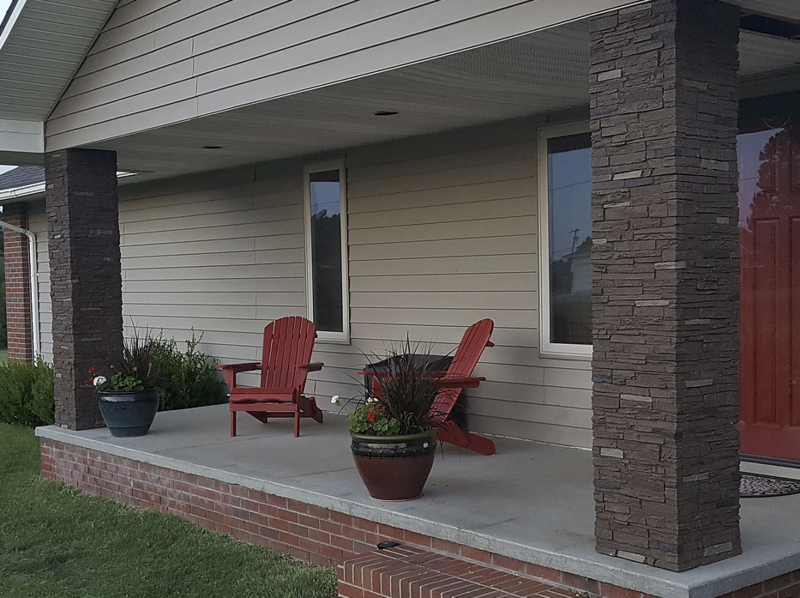 By engineering a product that replicates the look of natural or cultured stone, NextStone™ can add visual appeal and energy savings to any home or building. Slatestone Panel dimensions are 8 ¼” x 43? x 1 ¾” and cover 2.14 square feet. Stones vary from ?” to 2 ?” in height. Also available: Inside and Outside Corners, Ledger Boards and Mounting Blocks. See brochure for details. 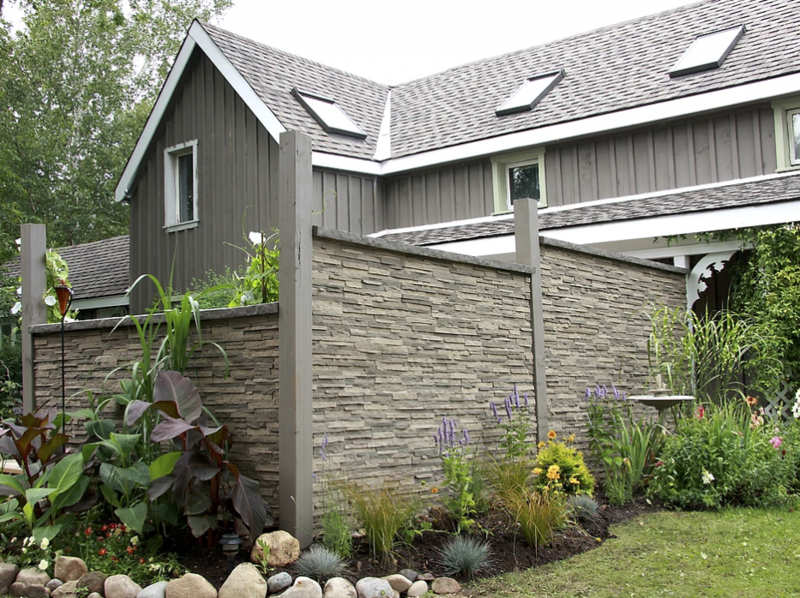 Stacked Stone panels are 13¼” x 46 ½” x 1 ½” and cover 3.63 square feet. Stones vary from ¾” to 1 ¾” in height. 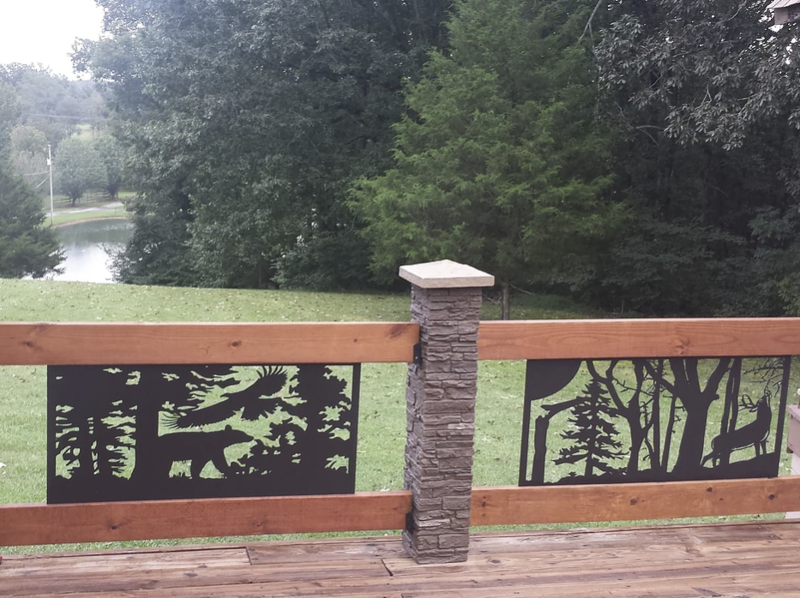 Decorate deck posts, fence posts or any yard feature. 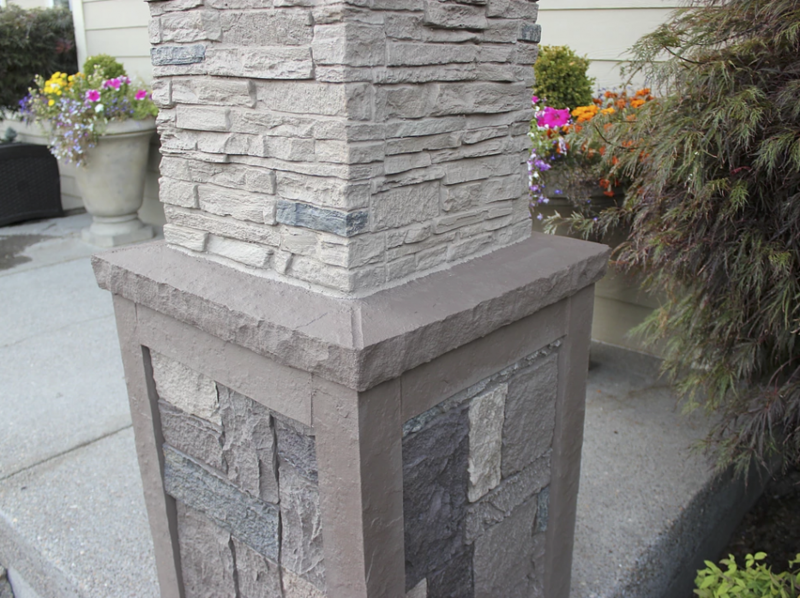 NextStone™ Slatestone Post Covers can also be used to enhance indoor columns and post accents. You can even add ambience with integrated low-voltage lighting systems – complete with dimmers and timers for energy efficiency. Touch Up Paint Kits come with the various colours of each rock pattern as well as the matching trim. Use for painting and seams or for general touch up. Used for touch up, fill in any screw holes or caulk any seams or miter corners with the grout. The sandy like texture blends in with the rock perfectly and is paintable. What is NextStone made of? 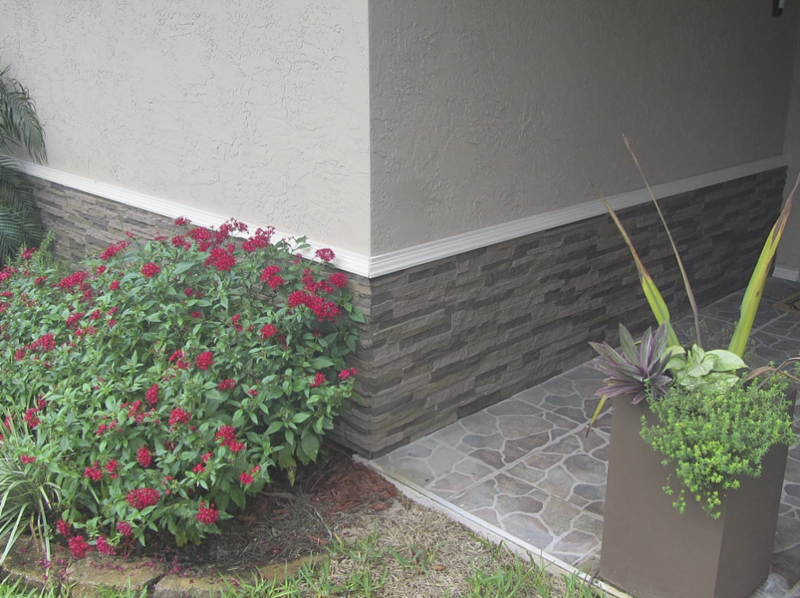 NextStone™ is made of a composite Polyurethane, reinforced with recycled PVC for durability. They are mixed with UV inhibitors and fire retardants. All panels and accessories are created with a proprietary in-mould coating to prevent fading, then hand painted with an exterior durable paint. Can the Panels and Accessories be cut? Yes. Panels and accessories are very easily cut with any standard saw you would use on wood. Can NextStone be installed around a fireplace opening? Yes it can. If you have a gas or electric fireplace, the product can be installed up to the opening. NextStone products are designated as nonflammable. If you have a wood burning, open-hearth fireplace, the product must be installed with a set-back maintained at least the distance recommended for wood products. All manufacturers differentiate this in the use of products in their installation guidelines. Check with the manufacturer of your fireplace. Can the NextStone panels be installed onto foundation? Cement? Cinder Block? Yes they can. Installing NextStone requires the panels and accessories to be screwed on any flush substrate. This application is no different than attaching the panels onto cement or cinder. Strong cement screws are needed is the only difference. Standard or Stainless Steal Tapcon screws are the most popular used. The use of Plywood or OSB board onto the cement then NextStone onto the board is also a popular way of securing the panels. Are expansion & contraction a concern? 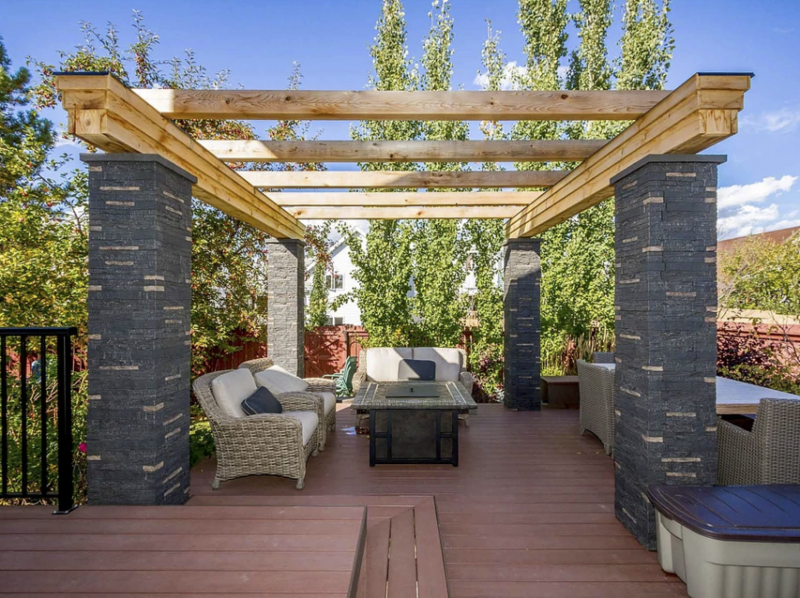 Although Polyurethane has minimal expansion and contraction, it is recommended to acclimate the NextStone™ panels to even further minimalize any movement once they are installed. To acclimate the panels, simply open the box and let them “breath”. No need to remove panels from the box and make sure this is done in a covered area such as a garage. Acclimate for 24-48 hours. During installation, make sure to install panels and components tightly together. See NextStone™ classroom videos for installation tips. Can an adhesive be used on the NextStone? Any Polyurethane adhesive, such as PL Premium Construction Adhesive by Loctite, can be used with the NextStone product. Over time, the adhesive may wear or deteriorate, therefore installing with screws is the best recommended. Are the NextStone Post Cover Caps and Column Wrap Caps different? Slatestone Post Covers are specifically for covering 4×4 or 6×6 deck posts, fence posts, porch posts etc. They are 8″ x 8″ x 41″ and have specific caps to go with them. The caps are called Post Cover Caps and are 10.5″ x 10.5″ x 3.5″. The Post Cover Caps come in Sandstone colours: Brown, Buff, Charcoal, Gray, Graphite, Onyx, Red. The Slatestone Column Wraps can be used in any column application such as a base of a post or large structural columns. They are 16″ x 16″ x 30″ and have specific Sandstone caps to go with them. The caps are called Sandstone 18″ Caps and are 18″ x 18″ x 3.5″. The caps come in Sandstone colours: Brown, Buff, Charcoal, Gray, Graphite, Onyx, Red. Can NextStone be installed in showers? Yes. A vapour barrier will be needed to protect the wall from possible moisture. The panels have recessed air chambers and weep channels on the backs of them so if any water does get behind them, it will drain out. Soap scum can be cleaned with mild dish soap and soft brush. Some chose to put a clear coat on the panels and that is ok as long as it is compatible with Polyurethane and latex paint. How does NextStone standup to Woodpeckers? Woodpecker problems are not common with the NextStone product although there have been a few instances in areas where woodpeckers are prevalent. Although durable, constant pecking in a particular area with a sharp beak, or any sharp instrument for that matter, can cause damage to the finish and eventually go through the entire thickness of the panel. Although NextStone is extremely durable to the elements, nothing short of real stone can stand in the way of a motivated woodpecker. If you live in an area where Woodpeckers are problematic, please contact our office for helpful installation hints to assist in deterring the birds from wanting to peck. Can a clear coat sealant be used on the NextStone panels? Yes. Sometimes applying a clear coat to help protect the panels from grease splatter behind a kitchen stove is a conventional idea. NextStone recommends a Polyurethane Clear Coat by Minwax.